Our team is all about customer service – with a smile. 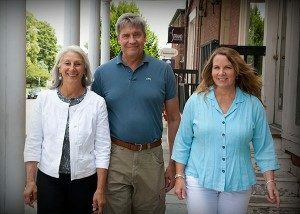 We are residents of the community; between the 3 of us we have handled every kind of transaction imaginable, from historic home and estate sales to new home sales, foreclosures and short sales and small commercial buildings. We’ve appeared on behalf of our clients in public hearings, we go the extra mile for everyone of clients and we pride ourselves on representing our clients interest to the best of our ability. Whether you are a first tome homebuyer or a seasoned home seller, we want to work with you and your family and friends.